The name \'Hiatus\' connotes pause, an opulently peaceful arena to take a break from the fast life of the city and get rejuvenated and refreshed to hit it back. There are restaurants that swear by their fusion and experimental cuisine. There are kitchens that boast of its chef’s bold artistry, and then there are places that are fabled for their lush green foliage and pristine atmosphere. The Hiatus is an amalgamation of all three. Located in the heart of South Delhi, it is a voguish dining destination in the capital’s elite Clarion Collection-Qutab Hotel. The first hospitality venture of GB Fine Dine & Hotels Ltd under the leadership of Jalandhar based entrepreneur Saurabh Bhandari, The Hiatus was conceived in December 2013 with a concept of progressive world cuisine and the rare molecular gastronomy to dish out an ultimate luxe and opulent dining experience. The name ‘Hiatus’ connotes pause, an opulently peaceful arena to take a break from the fast life of the city and get rejuvenated and refreshed to hit it back. At The Hiatus, the journey of discovery begins from its entrance that is complemented with a stone path surrounded by a charming green space on one side and a clear pool on the other. The restaurant is a compilation of different shades and moods. The opulence starts from the H-Bar,which is an urban bar housing a fair collection of international spirits and serving an innovative range of cocktails. The intimate seating and warmly-lit interiors with walls adorned by wine and cigar racks provide for an ideal setting to the modern-day globe-trotting gastronomic enthusiast. The kitchen at The Hiatus swears by its world-class techniques of food preparation and in-house ingredients. There is a special garden to cultivate herbs. Meanwhile, the delightful dishes served on the platter are mastered by the chefs through latest science and technology. For instance, the meat and vegetables are cooked using Sous-Vide, a dehydration technique by which the water within food is evaporated at a low temperature to let the food remain raw and retain its original nutrients. A popular technique in the US, Sous-Vide has recently entered the rare Indian kitchens. The main attraction in the kitchen is a long table called, the Chef’s Table. The table seats the chef’s guests for a special customized meal. The Dine-In-Cellar at The Hiatus is a private dining hideaway that demands prior reservations owing to its tailor-made menu complimented with an impeccable selection from the exhaustive wine list – a duet that propels the senses of gastronomic aficionados, on a culinary journey across the world. The uber chic room comprising hideaway walls stacked with wines surrounding a huge vintage style marble table and chairs rooted at the centre is an ideal spot for privy affairs. 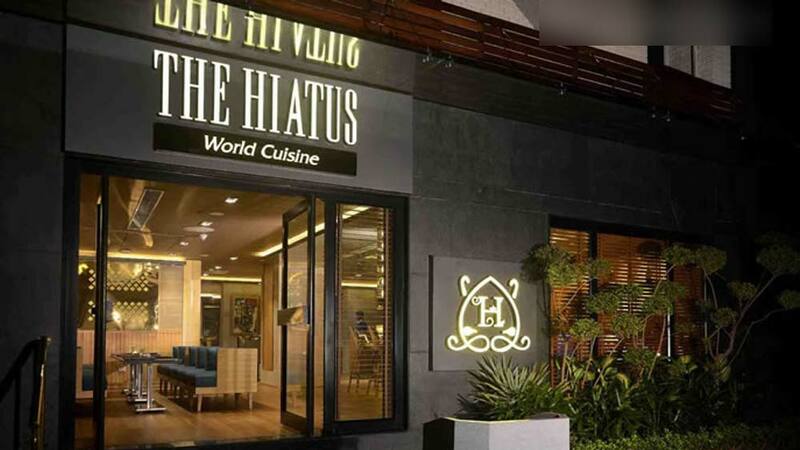 A symphony of great food, ambience and stylish service, The Hiatus poses as a shining star in the city’s lifestyle skyscape. 30-35 per cent people are health conscious- Mohit ..